Europe and northern and western Asia. Esters of sesquiterpene alcohols (petasine, neopetasine, isopetasine). Anyone looking for the butterbur should go for a walk along a stream. This imposing plant, which grows up to 60 centimetres high, is happiest on the banks of watercourses. The soil should at least be loamy and moist. The plant shares a special feature with its close relative the coltsfoot. In March and April, first of all a thick hollow stem pushes out of the still snowy earth, on which the small whitish to pink flower heads are to be found (consisting of several individual blossoms) like small artists’ paintbrushes. Only at the end of the flowering period do the round to heart-shaped leaves grow; these are woolly grey underneath and with a diameter of 30 cm are among the largest of our domestic flora. In winter the plant retreats back to its thick rootstock, which creeps through the earth and establishes itself in adjacent areas. The butterbur has a spasmolytic, analgesic effect. It relaxes smooth muscle (spasmolytic), and balances and soothes the nerves. 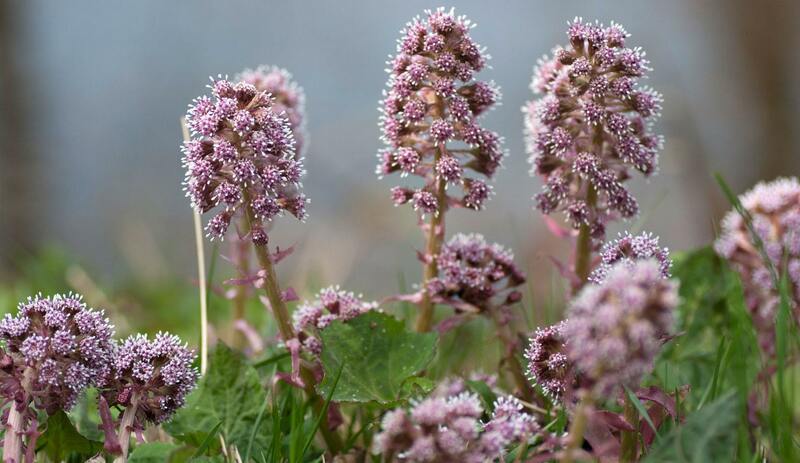 Because of these properties, butterbur preparations help paroxysmal coughing, neck pain, headache, migraine, heart complaints caused by coronary spasms, nerve-induced biliary disorders, functional gastric disorders, intestinal cramp, irritable bladder, kidney stones and menstrual pain. Particularly in the prophylactic treatment of migraine, astonishing results have been achieved with butterbur root extracts. Good results can also be achieved with butterbur in the treatment of hay fever. The scientific name Petasites comes from the Latin word “petasus” or Greek “petasos“= large, wide-brimmed hat; possibly a comparison with the large leaves which many peoples used as sunhats. The butterbur got its German name “Pestwurz“ in the Middle Ages when it was used as an agent against the plague. The sweat-promoting root was said to repel the fatal disease with a sweating cure; an attempt which was not very successful. Perhaps at least the fresh leaves applied to the buboes relieved the pain. As early as the time of the Celts, butterbur was used for wound healing. The Slovaks were convinced of the powerful healing effect of butterbur on asthma, worming treatments, epilepsy and as a diuretic, wound-healing and skin-cleansing agent and called it the “nine-power-leaf“: according to their folklore the leaf had nine veins with nine powers against nine different diseases. The butterbur has many special features: the blossom grows before the leaves which look almost like fungi with their thick stems; the leaves are extremely large and the root is very fleshy. The root has an affinity with the nervous system; on the other hand the large leaves of the butterbur indicate a connection with balancing the middle part of man’s body, where, among other things, the respiratory system is to be found. The flowers correspond to man’s metabolic processes. If the flowers appear before the leaves, this symbolises excessive metabolic activity, which is not balanced. The extremely large leaves grow at the end of the flowering period, as though they were extinguishing the heat of the blossom. Moreover, butterbur has a close affinity with water. From these particular qualities the following picture of its effect as a medicinal plant can be drawn: an early-flowering plant corresponds to excessive metabolic processes, the large root to cramps in man’s rhythmic system. Signs of inflammation are halted and moderated by the large leaves and the cooling aqueous element.